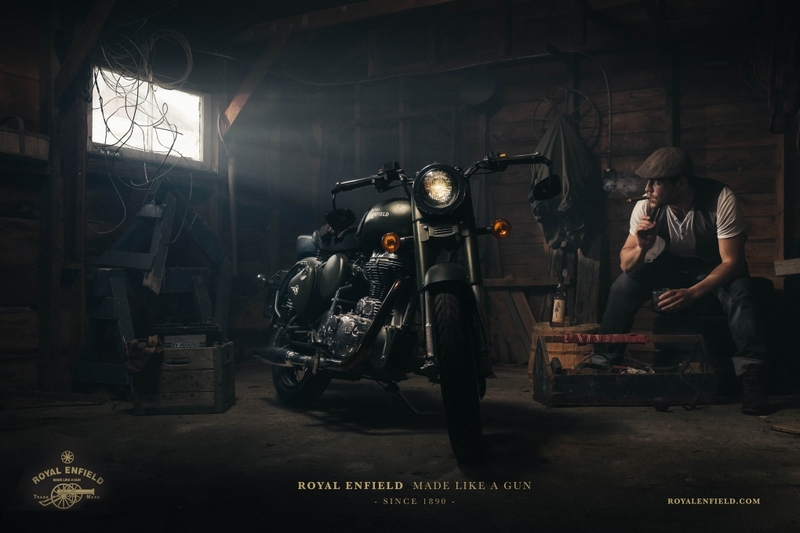 His brother Adam (model) suggested we do a shoot with him and his lovely Royal Enfield Motorcycle. We jumped on the opportunity. We had the subject(s) and now we needed a location. Grant suggested we use his grandmothers old garage, I loved the idea and off we went. The day of the shoot I brought all my kit. A couple DSLRS a ton of lenses, lights etc Oh and the smoke machine. So after we cleaned up a little bit we brought the bike in and started making exposures, checking ambient levels, thinking about lens choices when I realized that what I wanted, but more importantly didn't have, was a 35mm lens. This + my knowing I was going to need to kill some ambient light, led me to the decision to use the little camera that could for the entire shoot. We place the bike where it is in the final image right from the start, initially we were planning on having a light come in through the window and act as backlight for the machine but found this setup to be much more effective. The first light we put up was an Alien Bee 800 with Beauty dish. I am fairly certain it was diffused. It was on a light stand that brought the light up and into the rafters in front and above the bike. Initially we found there was too much spill happening on the ground, so we used a 5in1 reflector disk I had in my car as a flag to cut the light that was hitting the floor. This was all fine and good and we knew we had it where we needed it. The problem now was that the background and model were hiding in darkness and due to the higher shutter speed used, the ambient was not lighting him the way it was looking to our eye. Coming from film, I love haze. I can be a bit cliche, but I believed used correctly it adds something wonderful to an image, I also knew with the light blasting through the window outside we were going to get a great llightbeam coming through the window. It was helped a great deal by how many air leaks there were in the garage. Happy little accident. The smoke coming out of his mouth was real, he was actually just smoking the cigar. Albeit a little harder than normal. A lot of what you see in the image was already in the garage. If it ain't broke, don't fix it. The bottle of Sailor Jerry's in the background was the idea and addition of the model however, as was the jacket and the toolbox. The toolbox was found in the basement and actually full of woodworking tools, but it just fit. Not a whole lot. Due to my absolute inefficiency in photoshop and love of cinematography, I tend to try and get everything right in the camera. Granted there is always going to be some tweaking needed in some form or another, but for the most part I try my best to not need to open photoshop. In this case it was just to remove a logo on a battery. In lightroom there were the usual contrast/exposure/colour adjustments. As well as local adjustments to accentuate certain elements. I actually created the light from the headlight with the exposure brush as well as the flame on the tip of the cigar. The dodge and burn look was created with a clarity brush/contrast brush. But overall I spend under an hour in post. After the narrowing down process was complete, my friend and amazing graphic designer Tora added some graphics and text and this is the image you are looking it. I hope that answers some of the question people have about the image. Nice work. Love that you did it with an X100s. Just an amazing image! Awesome! Congratulations on POTD! That is really good work and thanks for the explanation. awesome shot, would love a print! Get in touch. We can make something happen. Thanks for all the love everyone it means a lot. Great work man! thanks for the explain of the picture. great mood in this. very cinematic. Thanks for the behind the scene look. Always appreciate when photographers do this. Great work! A world class shot. Thanks for sharing your work process too. I remember seeing this photo a while back and the explanation behind it. This is great work. Well done.